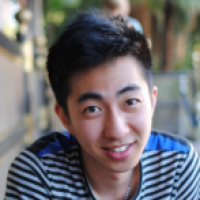 Does your product or feature solve a pain point? Or is it an additional benefit? Before I write any emails, these are the questions I ask myself. Since I write a lot of the email marketing assets for our lead nurture tracks, I need to think about how to market or talk about our new products and features, especially in the different tracks we have e.g. I will create different marketing copy for emails pertaining to our top-of-funnel nurture tracks vs. our upsell nurture tracks. It is also helpful for me to apply frameworks around my various approaches. I learned this way of thinking from product management where we spoke about “pain killer vs. vitamin features” as a framework for product design. Pain killer features solve problems. If you have an ache, you take a pain killer. Whereas, vitamin features are more preventative. You take vitamin c to keep you from getting sick. Applying that to emails –how do you present this information? In the above pain killer email, we wanted to call out a pain point around many marketers not being able to fully utilize the powers of social to engage with consumers. And then we wanted to highlight a product feature that enables you to integrate social and email for increased engagement with customers. People however don’t buy features. They buy what features enable them to do. In this email we talk through the pain point and apply it to a relevant content piece that discusses how to overcome those challenges using our social features. We tend to use these pain killer types of emails often in our top-of-funnel nurture tracks where we can target specific pains that we know many marketers experience. Vitamin features don’t directly solve problems as they serve more of a preventative function. You take vitamins so you don’t get sick and because they make you healthier and stronger. Vitamin based emails are exactly that. Sending emails with features and products that prevent problems or help take you to the next level. We use the above vitamin email for upsell because the audience already knows what our product does and what pain points it helps solve. 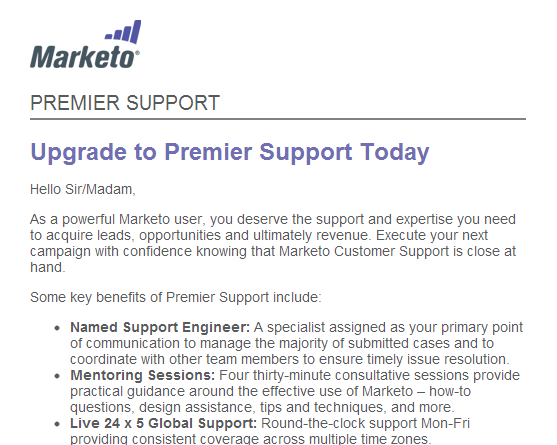 We directly address these users: “As a powerful Marketo user,” and tell them the benefits they get with upgrading their customer service: “Some key benefits of Premier Support include.” Using bullets then allows you to group the benefits and provide logical arguments for why the service / product you are providing are beneficial. By explaining to your customers why certain upgrade features are preventative, you can resonate more with your audience. Products and services serve different functions (some are pain killers and others vitamins), which is why it is important to write about them in different ways, especially in nurturing where assets are either used for nurturing prospects or for getting customers to upgrade. How do you communicate your product features and benefits? Do you have certain frameworks for thinking about them? 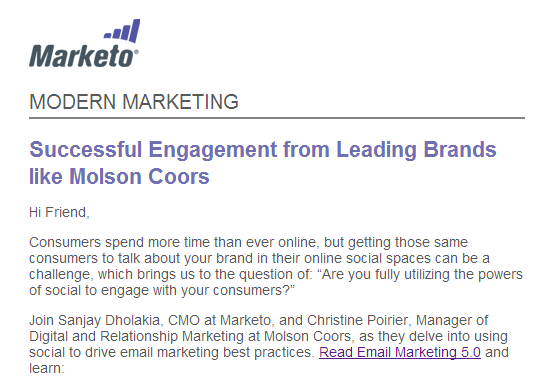 How do you think about upsell emails differently from top-of-the funnel nurturing emails?